Qantas Boeing 737-838 Reg. 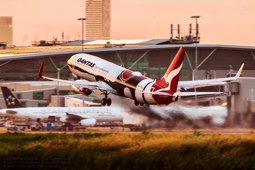 VH-XZJ ‘Mendoowoorrji’ departs Brisbane, Australia at Sunset. Aircraft heading to Auckland New Zealand as flight QF125. 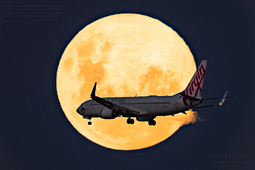 VH-BZG Virgin Australia Boeing 737-8FE 'Vivonne Bay' crosses through the Near Full Waxing Gibbous Perigee Moon (99.8%) not long after Moonrise. Tigerair Australia Airbus A320-232 Reg. 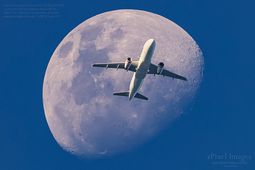 VH-VNF crosses the Waxing Gibbous Moon 80.2%. Aircraft enroute Brisbane to Adelaide, Australia as flight TT311. Qantas Boeing 737-838 Reg. 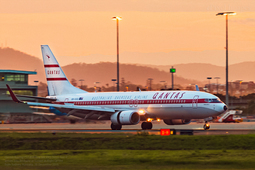 VH-VXQ ‘Retro Roo II’ arrives into Brisbane at Sunset as flight QF544 from Sydney, Australia. Ah that typical brief glow for about 5 minutes or so we often seem to get around Sunset during our Summer here in Brisbane! 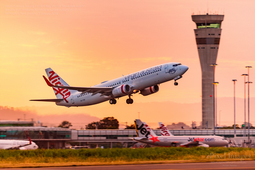 Virgin Australia Boeing 737-8FE Reg. VH-YIW 'Mona Vale Beach' departs Brisbane, Australia at Sunset. Flight VA105 to Wellington, New Zealand. 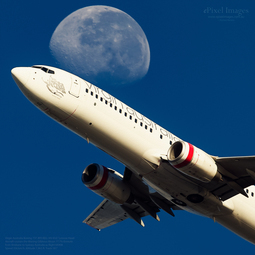 VH-VZR Qantas Boeing 737-838 'Coral Bay' crosses the Waxing Gibbous Moon 80.2%. Aircraft as flight QF597 heading from Brisbane to Perth, Australia. 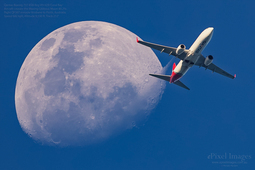 VH-VUZ Virgin Australia Boeing 737-8FE 'Lennox Head' crosses the Waning Gibbous Moon 77.7%. Aircraft enroute from Brisbane to Sydney, Australia as flight VA908. Mark Greenmantle Lovely capture as always Michael! Cobham Aviation BAe 146 300QT Reg. 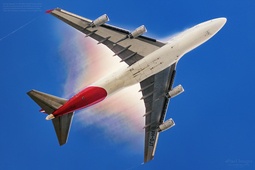 VH-NJI passes through a rainbow. Cobham Aviation BAe 146 300QT, Reg. 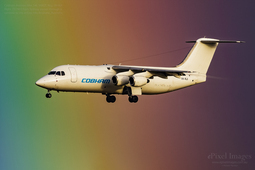 VH-NJI passes through a rainbow. Flight JTE7443 from Sydney on final approach into Brisbane, Australia. 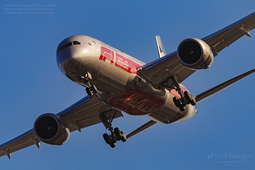 Etihad Airways Boeing 787-9 Reg. 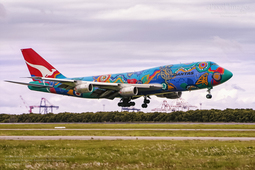 A6-BLV 'Formula 1 Abu Dhabi Grand Prix 2018’ Special Livery on her first arrival into Brisbane, Australia from Abu Dhabi as flight EY484. 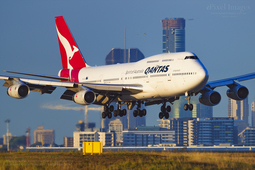 Qantas Boeing 747-438 Reg. VH-OJS 'Hamilton Island' arriving just after Sunrise into Brisbane, Australia from Los Angeles, USA as flight QF56. Ah and look there are a couple of our famous bin chickens scooting past in the background!! flight QF16 from Los Angeles, USA. 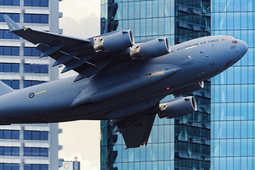 RAAF Boeing C-17A Globemaster III performing for Brisbane Festival Riverfire Brisbane Australia, it came in very low and only for one pass, giving a brief but awesome display before climbing out of the CBD! Image Date 22 November 2004. Ah the memories and those gleaming engines! 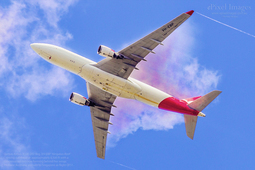 Qantas Airbus A330-202 Reg. 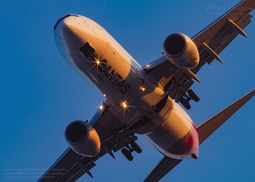 VH-EBN 'Clare Valley' departs from Brisbane just after Sunset as flight QF597, heading to Perth, Australia. Image Date 22 September 2018. 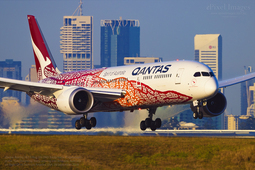 Qantas Boeing 787-9 Reg. 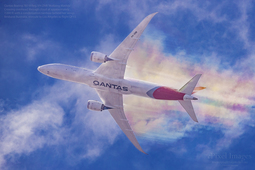 VH-ZNB 'Waltzing Matilda' Aircraft crossing overhead through cloud at approximately 7,000 ft with a condensation rainbow behind her wings. Brisbane Australia, enroute to Los Angeles as flight QF15. Qantas Boeing 737-838 Reg. VH-VYL ‘Wangaratta’ as flight QF536 from Sydney, Australia on final approach into Brisbane at Sunset.